Asia accounts for over 40% of the world’s internet users, with China alone having almost a third more people online than the US. Crucially, three quarters of the Earth’s residents speak not a word of English – that’s a lot of people. It’s safe to say that anyone looking to make money online is missing a very big trick by not tapping into the many millions of people in cyberspace that don’t speak English. 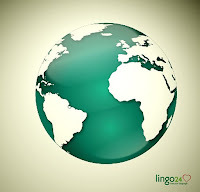 But how do you go about developing a multilingual online marketing strategy? Should you focus on language or country...after all, many countries speak the same language as each other? Or is it more important to focus on the dialectal differences between countries? We’ll let you decide what’s best for you, but it’s perhaps worth considering the following points before arriving at a decision. There are pros and cons to targeting markets either by country or by language. It’s important to plan correctly BEFORE initiating a strategy, rather than trying to engineer your website backwards after launching your foreign language portal. If you decide to focus on language rather than country, then hosting your website in target countries isn’t as important, as you aren’t trying to focus on one specific nation. Having a separate top-level domain (TLD) for each country can be expensive to manage and maintain, and all that before we even discuss optimising your site for each country. So not having to worry about this can save you a great deal of time and money. Language is one of the core defining characteristics of any culture, and by reaching out and speaking to a group of countries in their native tongue will earn you significant brownie points as a marketer. By translating your website into French, for example, you can make inroads into France, Belgium, Switzerland, Canada and various other French-speaking population pockets in Africa and further afield. The same applies to Spanish, which is spoken in Spain (obviously...), most of South and Central America and across much of the US. There’s no getting away from the fact that SEO is one of the fundamental and important tools available to online marketers. If you adopt a ‘language-focussed’ strategy, SEO can be a bit of a problem. This is because search algorithms are normally all about the locality of the search – so if you want to rank at the top of Google in Argentina, for example, you really want a top level ‘.ar’ domain that’s hosted IN Argentina. Google uses geolocation data in its search results, so you have to be as much ‘in’ the target country as possible to rank highly. Furthermore, the French in France is different to the French in Canada or Switzerland. For example, ‘Lunch’ is déjeuner in France, but dîner in Switzerland and Belgium. And to confuse matters further, in France dîner is the word for ‘evening meal’. In Spain, coche is the word for a ‘car’, but in many Latin American Spanish countries, coche means a baby-stroller. For UK readers, a baby-stroller means a ‘pushchair’ or ‘buggy’. You get the picture though – it’s safer not to ignore the significance of dialects in marketing campaigns. And this is why there’s a strong argument for having dedicated websites for each target country. By placing your online marketing focus on countries rather than languages, we’re talking about localisation rather than globalisation. As we’ve discussed already, in-country TLDs will benefit your search engine rankings in your target markets. It also means you’re competing with fewer other websites for your desired industry keywords, which has significant ramifications for your search engine rankings. Trust will help any international marketer go a long way. If an online consumer sees your website is written in the precise dialect of their country, and it’s hosted on a domain that is unique to their country (e.g. ‘.fr’ for France), then it helps build a sense of trust between you and them. The main disadvantage to adopting a country-specific approach is the cost. Individual domains, in conjunction with fully localised and optimised websites for each market will necessitate that some money be spent. But considering almost 200m people speak Brazilian Portuguese, developing a separate strategy for Brazil really is money well spent. Also, you won’t always need a separate strategy. For example, UK and US English is largely the same and you really don’t need to write two separate texts for each website – just make sure you avoid any blatant colloquialisms and points of reference that could alienate any other English speakers around the world. Hopefully these pointers will help you decide which strategy to adopt in your international marketing endeavours...good luck! Christian Arno is founder and Managing Director of Lingo24, a UK translation and localisation company with operations spanning four continents, clients in over sixty countries and a turnover of £3.65m.